Qray Titanium Bio Magnetic Bracelet & Scalar Pendant - TVC Skyshop - Buy world-class innovative products at affordable prices offering full value for money. The magnetic power which we are supposed to receive from nature don't reach us to a good extent because metallic things like car, bus, train, bike, concrete and the other metal equipment attract & consume most of the magnetic power available in nature. They come in between us and nature’s endowments. On other hand, TV antennas, mobile phone towers and high voltage electric wires emit & transmit dangerous electromagnetic radiations which reduce our energy level and blood circulation because of which we frequently fall ill. It is a therapy pendant. It produces high levels of negative ions. Wearing a scalar energy pendant enables your body to neutralize or reduce the negative effects of electromagnetic radiation from mobile phones and other electrical appliances. Diameter is 43mm and thickness is 4.5mm. 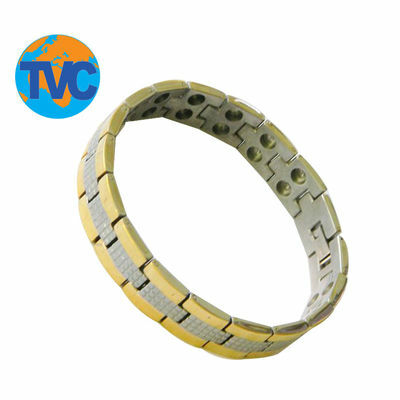 Titanium Bio Magnetic Bracelet The magnetic power which we are supposed to receive from nature don't reach us to a good extent because metallic things like car, bus, train, bike, concrete and the other metal equipment attract & consume most of the magnetic power available in nature. They come in between us and nature’s endowments. On other hand, TV antennas, mobile phone towers and high voltage electric wires emit & transmit dangerous electromagnetic radiations which reduce our energy level and blood circulation because of which we frequently fall ill. Titanium Bio Magnetic Bracelet which comes with 22 Neodynium Magnets & 10 Negative ions helps keep radiation’s effects at bay. It comes with top polish two tone IP gold plating. Titanium metal is corrosion resistance and has the highest strength-to-weight ratio compare to any other metal. It is a stylish new way to keep fit, length is 8 Inch & can be adjustable as per your wrist size. It is manufactured with Japanese technology & for best result it is recommended to wear both Bracelet and Pendant together Scalar Pendant It is a therapy pendant. It produces high levels of negative ions. Wearing a scalar energy pendant enables your body to neutralize or reduce the negative effects of electromagnetic radiation from mobile phones and other electrical appliances. Diameter is 43mm and thickness is 4.5mm.